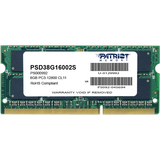 Intensify your systems performance using the Patriot Signature Line 8GB Laptop Memory Module. Built with 8GB of DDR3 memory it offer quality, reliability and performance at a higher speed of 1600 MHz. This module also features PC3-12800 memory speed for handling demanding applications. The 204 Pin offers easy connectivity between the module and the motherboard. With the SODIMM socket you get more connectivity options. It uses 1.5V of power for a reliable performance. Plus, this memory module runs at CL 11 latency timings. Purchase the Patriot Signature Line 8GB Laptop Memory Module as soon as possible!